We’ve lived in Asheville, North Carolina for over a year now. As travel bloggers and digital nomads who work online, Nathan and I spend a LOT of time at coffee shops. In fact, a lot might be an understatement. Aside from our home, I’d say we visit a coffee shop just about every day. These are typically where we set up shop and go to work doing our freelance writing and editing. We find we get far more done when we’re out and about (and caffeinated). Because of this habit, we’ve tried just about every Asheville coffee shop across the city and have discovered what we think are the very best coffee shops in Asheville. Heading to this area in the near future? Here are our picks for the best coffee shops in Asheville, considered through our special criteria. Traveling to Asheville? Stop for some awesome coffee! 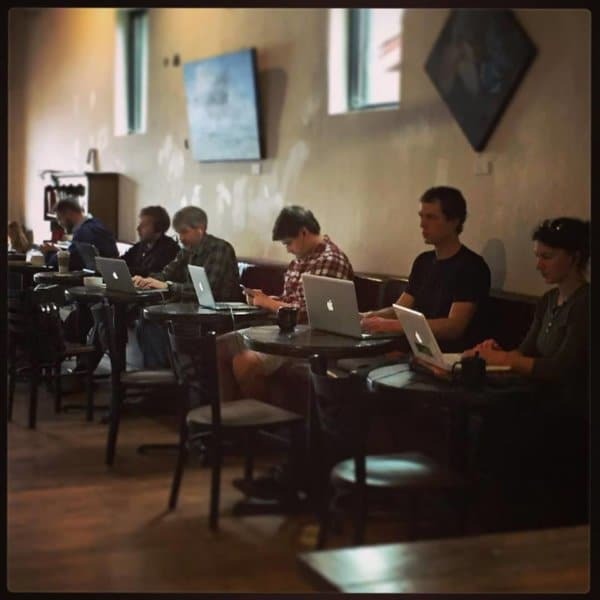 First, What Makes a Great Coffee Shop? Our ideal coffee shop is a relaxed, comfortable environment. There should be a nice mix of work-friendly tables and comfy, oversized armchairs. A fireplace would be delightful. The coffee itself should be outstanding, with plenty of options for hot and cold beverages, flavors, and teas. There needs to be soy, almond, or coconut milk available as we mostly avoid dairy these days. Free WiFi is an absolute must, and the more reliable the better. For a place to really hit the mark, we need an abundance of available electrical outlets to keep those laptops powered up. Music and noise should be minimal, for an atmosphere conducive to working, and it’s great if there are some yummy and affordable food items for sale as well. A coffee shop like that? We could stay there and work productively and comfortably all day long. Lastly, the top cafes should have excellent, friendly, and accommodating staff. 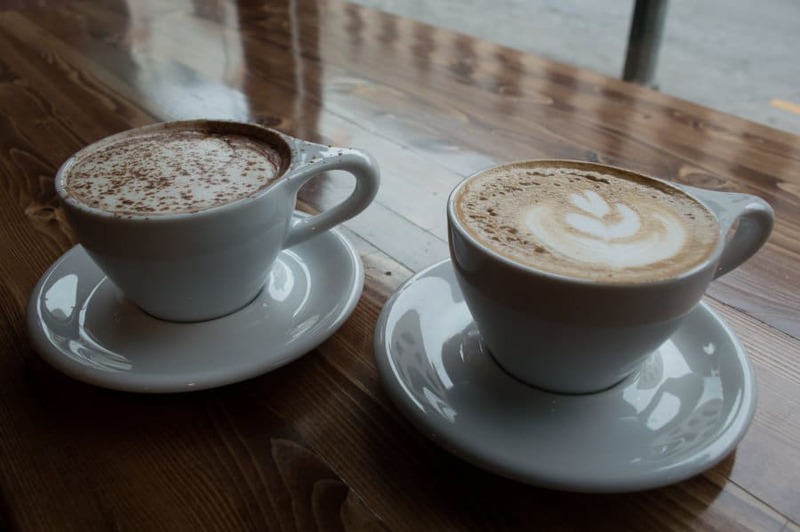 Let’s see how our fave Asheville coffee shops match up. 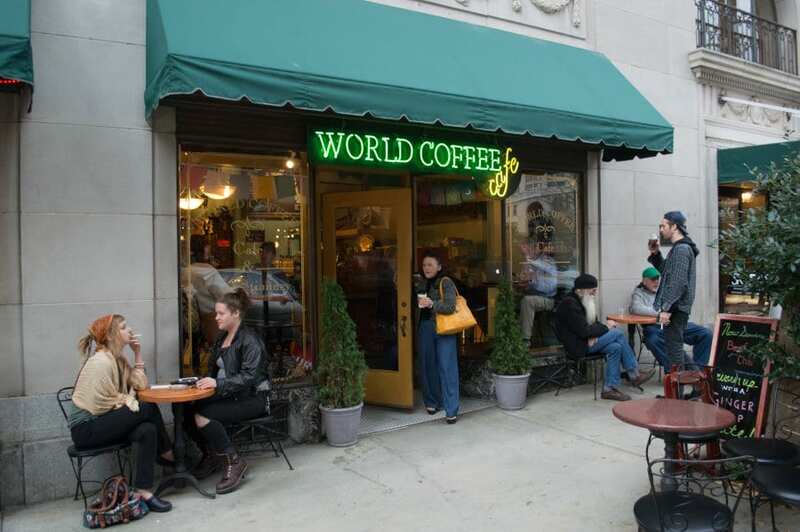 World Coffee is a great option for downtown Asheville coffee shops. With a convenient location near to parking, it’s one of our standbys. The service here is friendly and fast and the coffee is good. World Coffee offers different specialty drinks everyday, but we pretty much stick to our usual here: vanilla latte (Amy) and soy hot chocolate (Nathan). 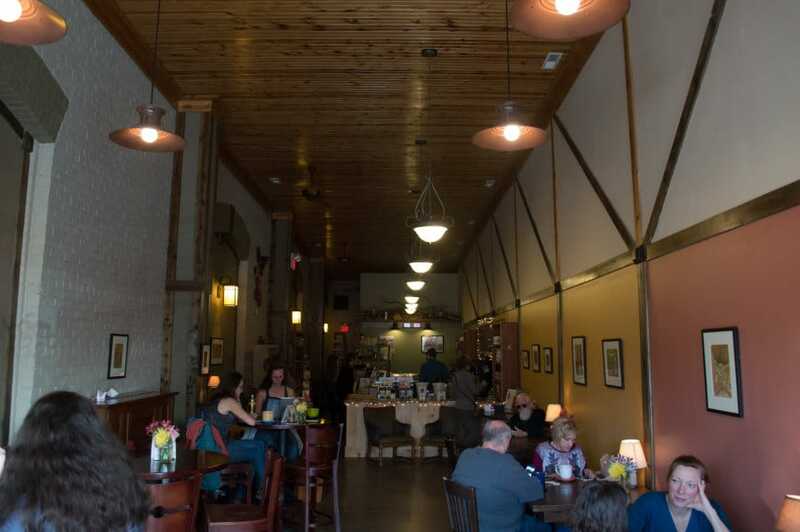 There are plenty of tables inside World Coffee, which has a variety of rooms. You can go down the back hall and you’ll find even more tables and space. Outlets are easy to come by at this coffee shop, so you can stay powered up all day and we’ve never had a problem connecting to the WiFi, which is totally free. Treats and a few lunch options are available as well, (though the sandwiches are a bit pricey). Our favorite thing to do is to head right next door for a lunch or dinner at the delicious Chai Pani, an Indian “street food” eatery that is incredibly delicious. 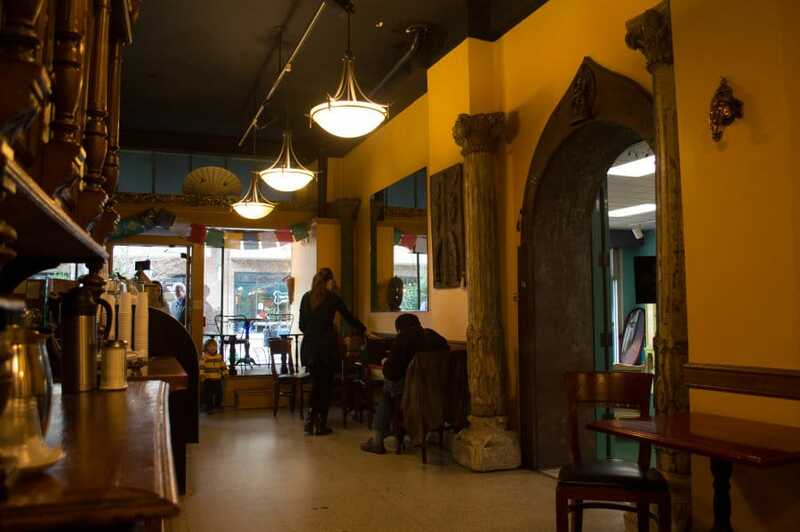 World Coffee has an eclectic, old world feel inside. 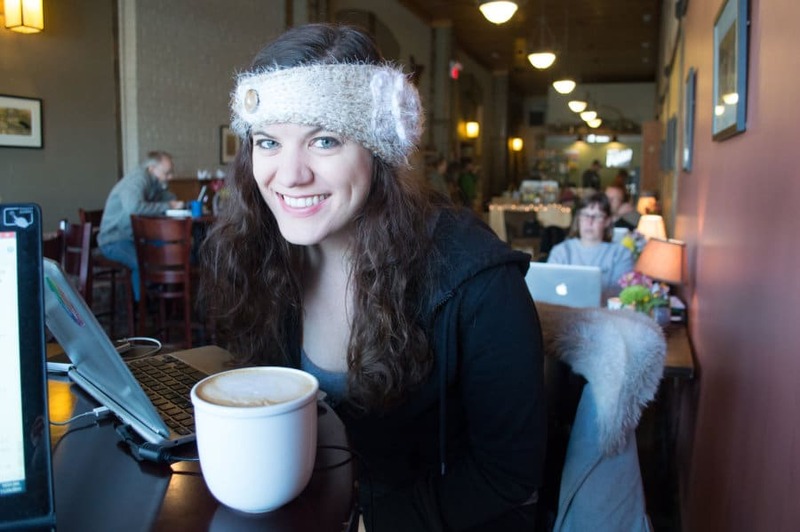 There are few fun options for West Asheville coffee shops. 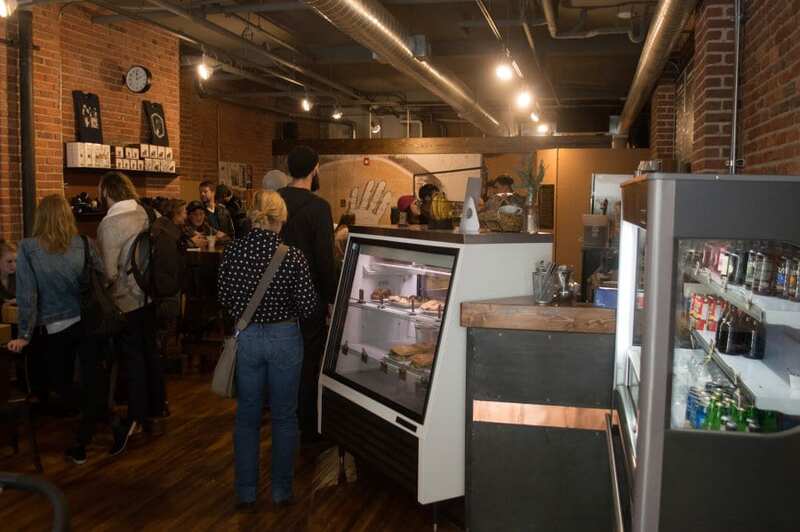 When we wrote our first version of this article, we included a different shop, but that is because we had not yet discovered the splendor that is Odds Cafe. This might hands down be my number one pick for the best coffee shop in Asheville, not just in West Asheville. Not only is the coffee terrific and reasonably priced, the staff is always really friendly, and the atmosphere is my favorite. The cafe is set up in an old garage-type setting, which means each end has a roll-up door. During any nice day, these are open, and the resulting breeze passing through makes this a cracking place to work. Not to mention, the WiFi is free and reliable, and it’s easy to find seating and plugs. And, for a final touch, they’ve always got great tunes on. There are yummy pastries and snacks available, and I must say yet again, the coffee is fantastic. They have unique specialty drinks and they offer my favorite non-coffee drinks: smoothies and Italian sodas. When looking for Asheville NC coffee, you can certainly stay within the city limits and enjoy some great choices. But Asheville proper is a fairly large area, but we’ve included other coffee shops on this list which lie a bit beyond because these are some of our favorites. Weaverville is a sweet town about 15 minutes north of Asheville, and it is where we like to go most often. 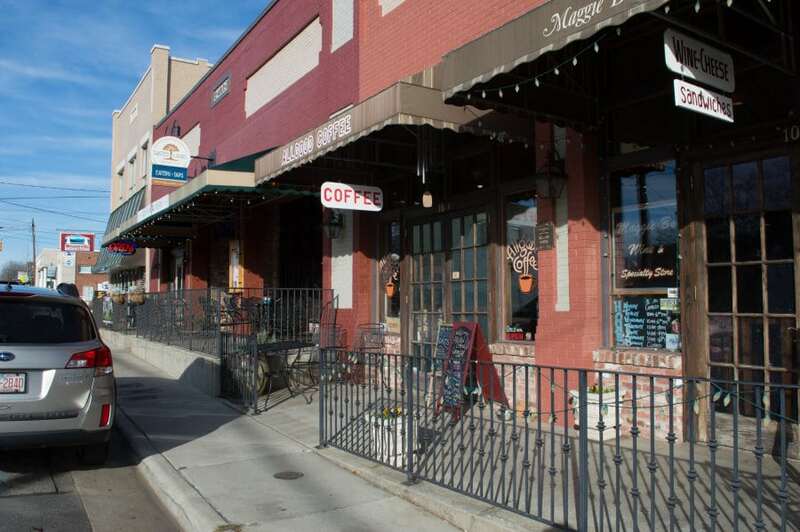 Parking is free and easy to obtain, and there are two great coffee spots right on the quaint main strip. All Good Coffee is a family owned cafe with the absolute friendliest staff. This is the kind of place where they know the customers by name. Each beverage is prepared to order with a real focus on quality. They go the extra mile to make sure your drink is to your liking. They are also very keen on offering the best blends of coffee and espresso, and it makes a difference. At All Good, you’ll enjoy your latte in a huge, warm mug as you listen to soothing music. It’s a very calm atmosphere here, so we always find we’re very productive at All Good. In fact, we are here now as I finish up this blog post. There are plugs within reach of almost every table and the WiFi is excellent. Unfortunately, the cafe is pretty small, so if it were crowded, plugs might be hard to come by, but we’ve never found that to be the case in Weaverville. The only other downside of All Good is that their hours are limited…they close by 5pm. 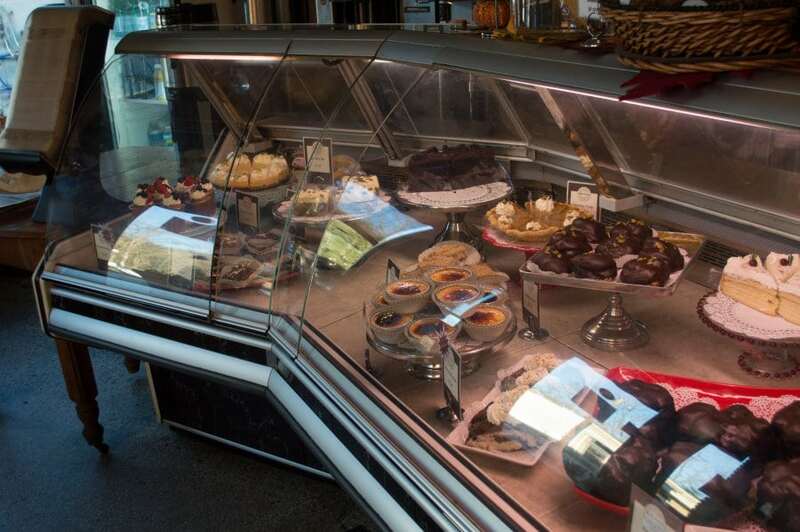 When we’re not at All Good, you’ll find us just down the road at Well Bred Bakery & Cafe. In fact, we often hop between the two. This awesome and popular establishment has two locations: one in Weaverville and one in Biltmore Village. 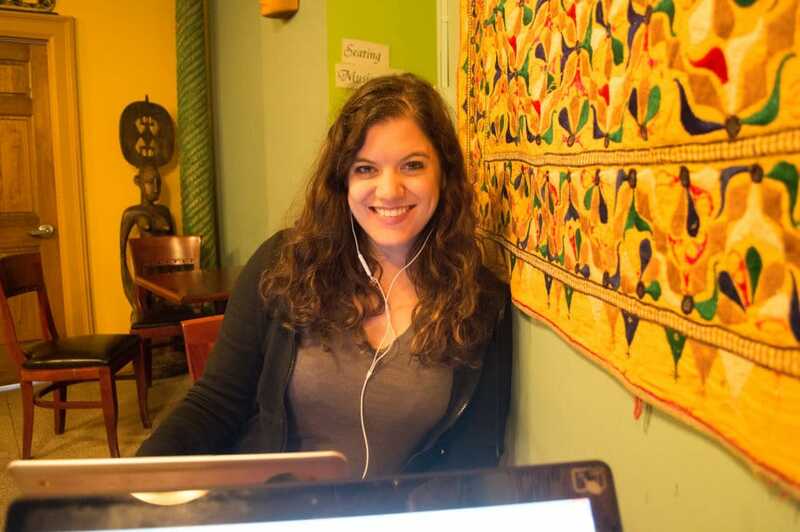 The Biltmore location is adorable and perfect if you’re looking for a cozy cup of coffee and a chat with a friend, but it’s not as great for working. I’ve never been able to get the WiFi working properly there for some reason. However, the Weaverville location has reliable WiFi, plenty of seating, and a fair number of outlets. They also have outstanding coffee, a friendly and welcoming staff, and the best pastries in the area. If you go, try their gigantic eclairs–they are to die for. We’re also big fans of their sandwiches and their homemade soups. I recommend the grilled cheese and sweet potato coconut soup. 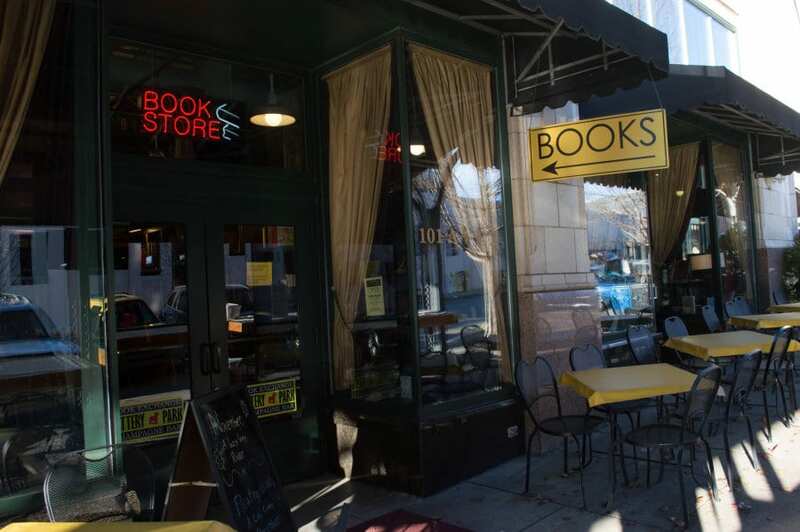 When it comes to the best coffee shops in Asheville NC, the Battery Park Book Exchange wins in terms of atmosphere. 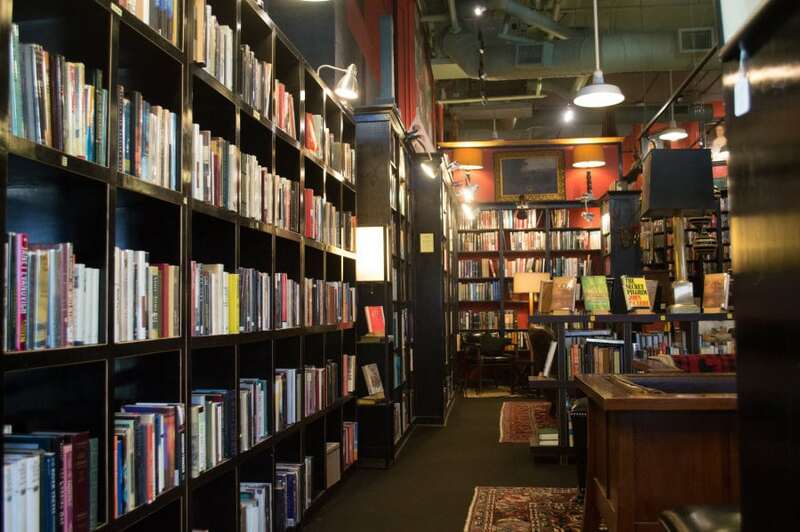 A huge, winding bookstore, this place is full of nooks and crannies to tuck up with a book and a nice mug of coffee. There are tons of places to sit, but this place is popular, and usually fairly crowded on the weekends. I love the feeling of this place and perhaps best of all, it is dog friendly. So there are often adorable canines wandering around alongside their owners. There is even a large fluffy poodle who seems to be the book exchange resident mascot. After you’ve enjoyed a nice flavored latte or hot chocolate, you can sample some of the fancy snacks on the menu. They have cheese plates, pastries, and other items. And this place is not just a bookstore, it is a Champagne bar! So when you’re ready to transition from morning to afternoon/evening, grab a glass of wine, bubbly, or beer. It’s a seamless change from workday to date at the Book Exchange. I had to include many pictures of this place simply because of its lovely feeling. 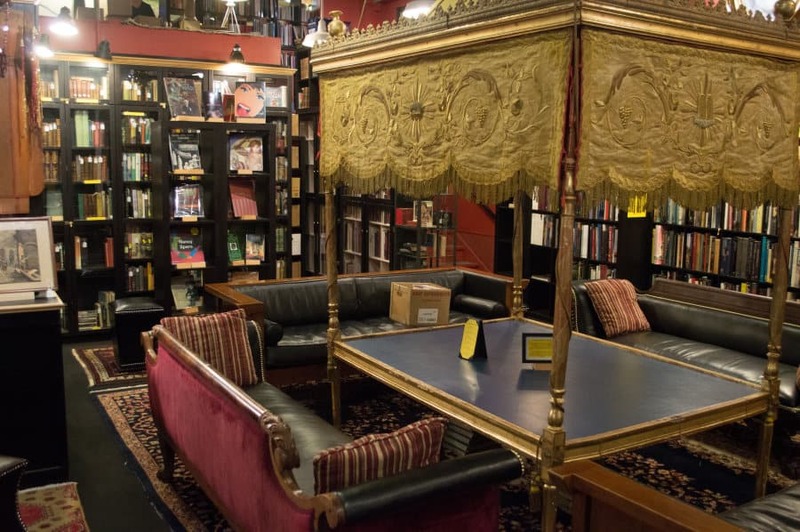 If you love books and being surrounded by books, this place is for you. Yet there is one very big downside to the Battery Park Book Exchange, at least for us. No WiFi. Somewhere along the way they stopped offering WiFi, and this is a real shame for us. For this reason, I recommend saving the Book Exchange for dates, reading, or Internet-free work. The lack of WiFi, along with a difficulty of procuring electrical outlets, makes this not so freelancer-friendly. But still one of Asheville’s most unique spots, and extremely worth a visit. 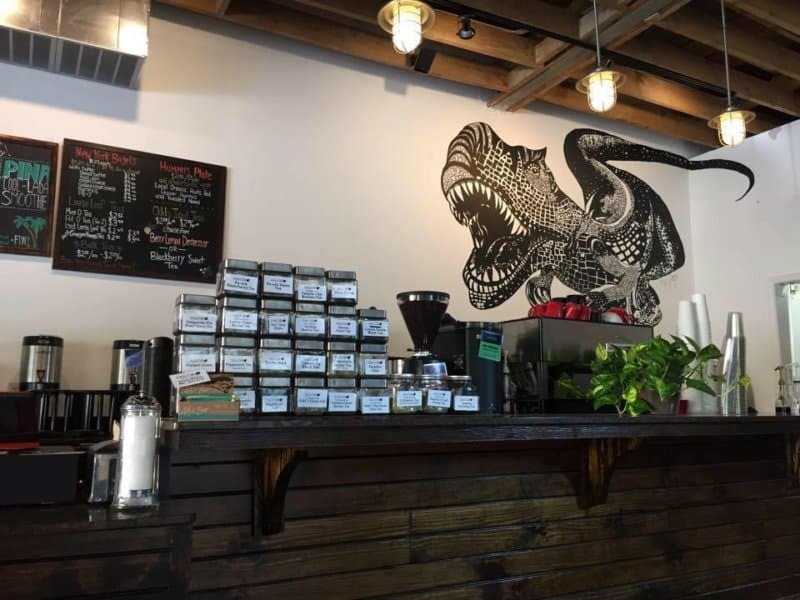 We only recently discovered High Five Coffee, but it has quickly become one of our favorites and is definitely among the best of the best for Asheville coffee. It has a fairly new location right downtown (and conveniently directly across from a parking garage). Though the cafe itself isn’t huge, it has that perfect coffee shop vibe. The music is always really good and the staff is very friendly. 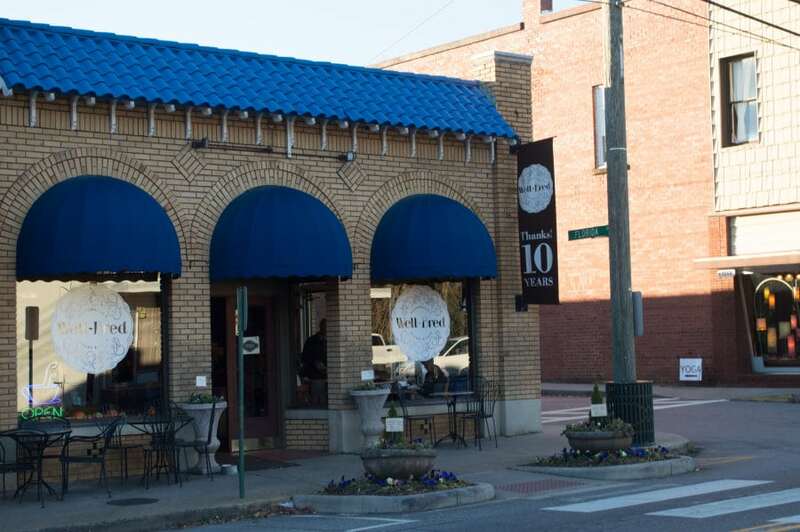 The location on Broadway which is just outside downtown is more spacious with abundant outdoor seating. Both spots are terrific for getting some work done. High Five also has the BEST vanilla latte I’ve had in the Asheville region. I believe they make their own homemade flavor syrup. They’ve got a few different coffee options, and also offer a barista’s choice. They take their coffee here seriously, and the result is an outstanding cup. Updating this post in 2017, we’re currently yearning for the frozen mocha they make at High Five. It’s sooo good. 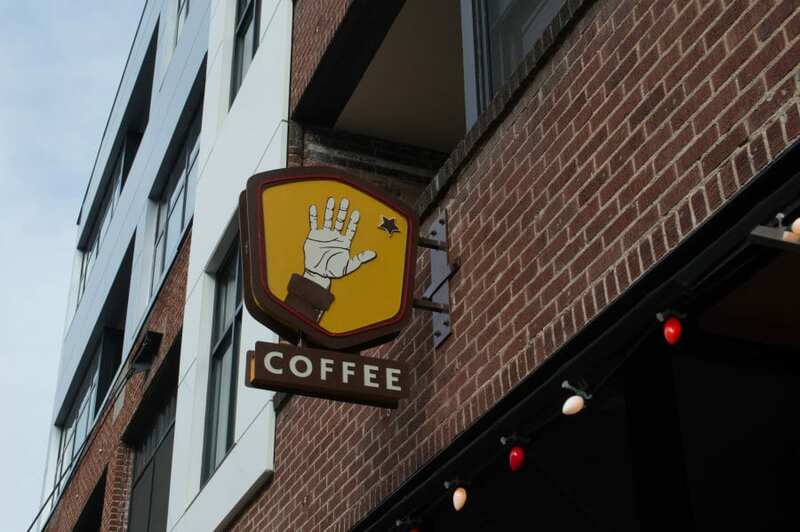 Judging by how much High Five is on our minds, even now, it’s safe to say this could be the #1 Asheville coffee shop! While there is free WiFi at High Five, you only receive 2 hours’ worth of access. If you make another purchase, they can give you a code to get more time, though. The Internet here is fast and there are a few spots you can find outlets to keep you charged up. The Dripolator is a place we’ve only been once or twice, but it is really great. It is located in Black Mountain, a quaint town just 15 or so minutes east of Asheville. 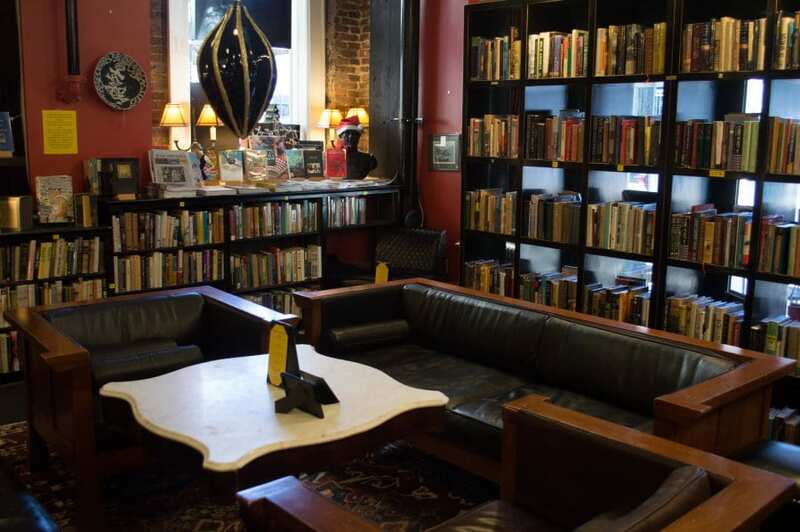 This is another place with that total coffee shop vibe…cozy, inviting, and pleasant. Last time we were there, I had a vanilla bean latte, and Nathan had a nutella mocha. The Dripolator’smenu is filled with delicious and unique drinks like that. They also make a mean smoothie. WiFi is free, though you will need a password, but plugs (and tables) are a bit hard to come by in this small space. 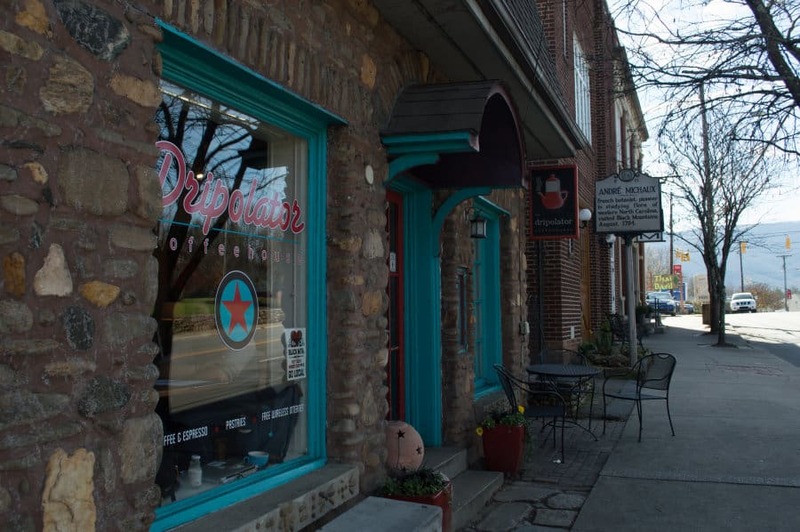 Did we miss one of the spots for the best coffee in Asheville? Let us know in the comments below. Pssst: We hope to add Trade & Lore Coffee Shop to our list soon. This place opened just before we left Asheville, but we had the opportunity to visit a couple of times and it was lovely. Happy to hear it’s doing well, and we plan to visit on our next trip to Asheville. 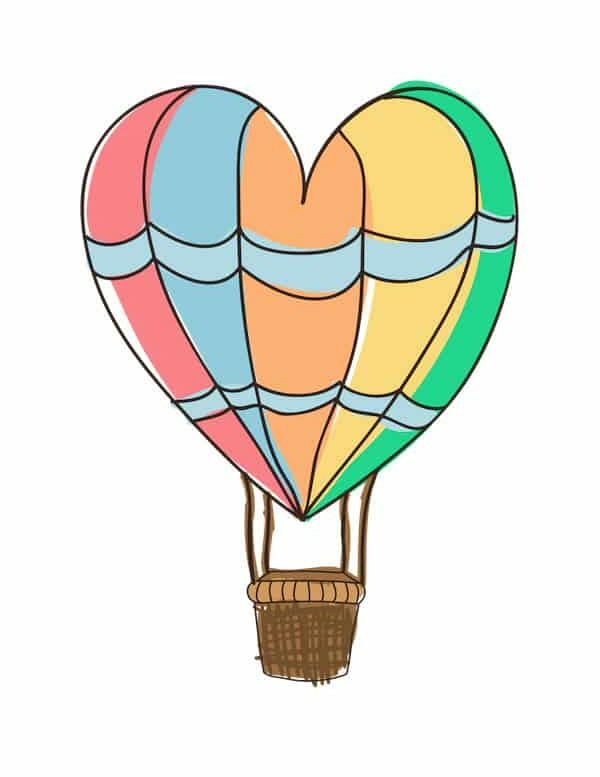 –> Traveling to Asheville? Check out this post by Wanderlust Dietitian for some great hikes and breweries to visit in Asheville. YAY this is perfect! I am saving this for my trip to Asheville next weekend. I am so excited! I will message you to see if you are around one of these places on Friday or Saturday 🙂 Thanks Amy! awesome! Yes message me when you’re around. 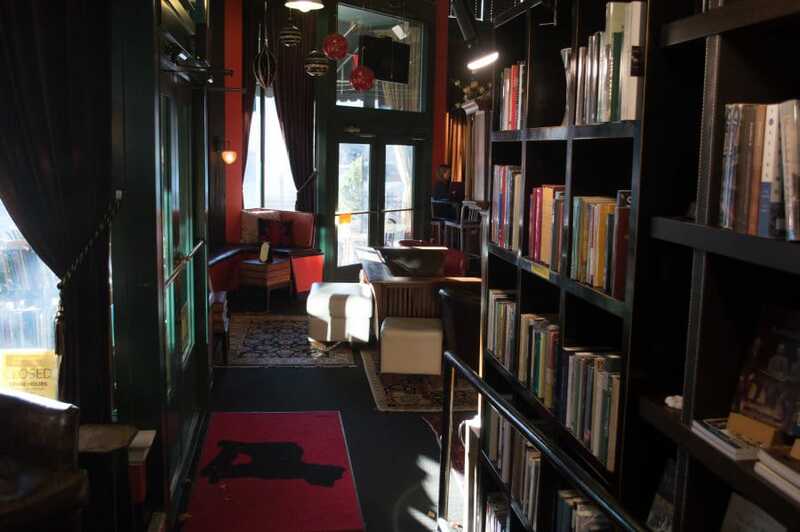 the Book Exchange is particularly cool! As someone who lives in Asheville, this is a good list! awesome! which is your fave? I’m so glad you posted about High Five! We stopped in there on our way out of town, and their mocha was delicious! Totally!! Thanks Hilary. Aw, miss High Five, their coffee is the bomb. FILO on the east side, great coffee and teas, fab pastries and a comfortable atmosphere. sweet! never heard of that one. is it fairly new? We’ve moved away since the summer 🙁 but there were many more we tried that we didn’t add to this. Like Trade & Lore. Awesome place! Moments Cafe is my favorite. Great cozy environment with coffee, smoothies, unique sandwiches, fresh baked goodies, and my favorite Jittery monkey coffee banana/chocolate/peanut butter/milk smoothie! At Swannanoa exit 59 across from Ingles! that sounds awesome! We never made it over there when we were living in AVL. Guess another visit is in order! Edna’s at the River is another great coffee with a quirky atmosphere. My wife and I live and Florida and after visiting Edna’s (both locations) we have now ordered pounds of coffee beans to be shipped to us. The park across the street is a great way to stretch your legs along the river after sitting too long. 🙂 Pet friendly too !!!! Hey that’s great! We visited Edna’s a couple of times and didn’t know about the river location. But pet friendly is always so nice for a coffee shop. Thanks for sharing! oooh yes we love that place! A great spot indeed. We also have a Dobra here in Burlington, Vermont where we live now! oh yeah we love Dobra Tea! We have one here in Burlington, Vt too. Such a peaceful spot and the tea is great. About a year old and located in the River Arts area, Summit Coffee is right up there with High Five. You’ll have to check it out on your next trip to AVL! oh that’s really cool! Is it a branch of Summit Coffee in Davidson? Nathan actually used to work at the one in Davidson!